The Adult Hydrocephalus Center at The Sandra and Malcolm Berman Brain & Spine Institute provides internationally recognized expertise in the diagnosis, treatment, long-term care and management of adults with hydrocephalus. The goal of the center is to provide family-centered care because hydrocephalus affects not only the patient, but also the family. 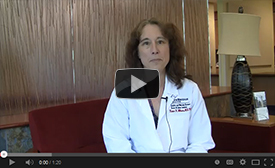 Robin K. Wilson, M.D., Ph.D., describes the Adult Hydrocephalus Center at LifeBridge Health. She is the associate director of the center. It is one of the many programs offered at the Sandra and Malcolm Berman Brain & Spine Institute.